Night time icons! We swear some of you are vampires, afraid of the sun in the night sky, so we’ve fixed that. Performance tweaks. Men are generally obsessed with performance of all sorts, and man oh man have we worked hard on tweaking ours. We also improved it in Pocket Weather. Radar fixes, lots of them. Rain predictions! We’re just beginning our journey into the prediction path but if you live in NSW, VIC, SA or TAS enjoy knowing when it’s going to rain, 7 days in advance! 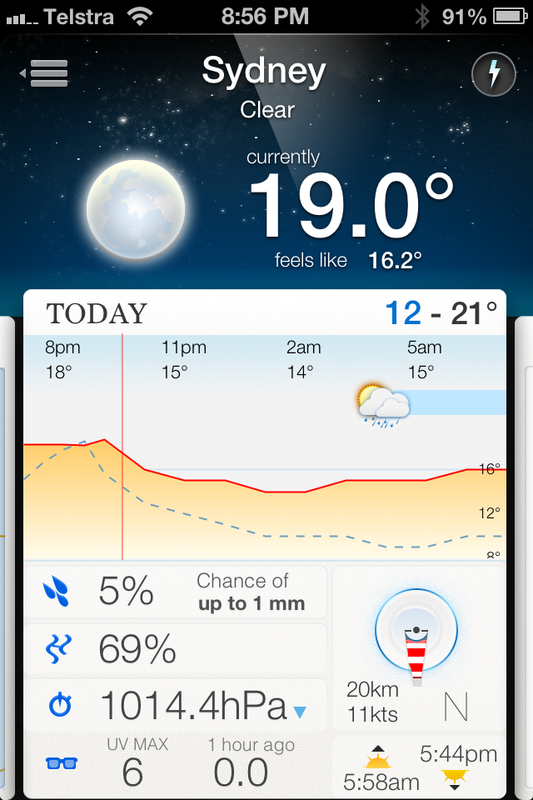 iPad now shows sunrise and sunset as well as the recorded overnight low and actual high. New setting on iPhone: open to top location. 300 other bug fixes, yes, this is SPARTA! We’re also eagerly waiting on the Bureau of Meteorology to release their new data into WA, QLD and the NT so we can show you all what you’ve been missing. We’ve heard rumours that this rollout starts in October. So as we say here in Shifty Jelly land “Enjoy the ride, there’s a lot more to come”.